What an awesome post! And it certainly is timely. We are awaiting Father Sean’s arrival early this afternoon. I’ll show him your post. Who knows, you may inspire him! Thank you, Deacon Jay. The timeliness wasn’t a coincidence. In fact, I almost missed my chance. I intended to post it a few days ago but knee surgery and being slow to get my thoughts together prevented me from posting it earlier. 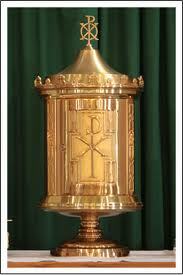 Get this: so I’ve been going to church on Saturdays all summer (at least when I’m in town) for an hour of adoration. 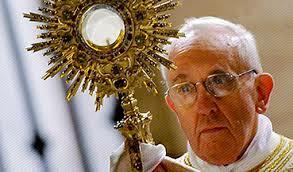 I went this morning only to find adoration already in progress with the Blessed Sacrament exposed in the monstrance. I missed the first Saturday of both July and August and didn’t know there was adoration on those days. I guess I ought to read the bulletin a little closer, huh? Very nice, Jerry! Thank you for your witness and inspiration. I share your love and joy in adoration. We are so very blessed! May the Lord continue to bless our community with His presence! Michelle, thank you for the compliment and thanks for reading. Wasn’t it a wonderful humbling experience to spend time with someone who exercises such humility as Fr. Sean? I feel confident that his spiritual infusion last weekend is the blessing our community needs to make our plans for Adoraton a success.